So, as this is my first post, I guess there’s nothing for it but to jump right in with my knitty natter! As a knitter I know that I’m not alone in my appreciation of a good bricks-and-mortar yarn shop. When I lived in Dalston (London), I had Knit with Attitude. When I lived in Reykjavík (Iceland), I had Storkurinn. 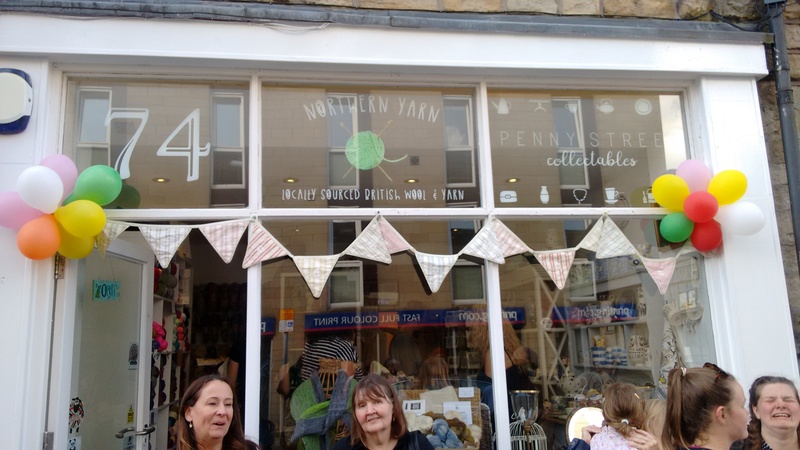 Up until a couple of years ago, my home town had three different yarn stores, each catering to the fibre requirements of the various categories of knitter, from the die-hard acrylic fans, to the hand-dyed, local wool yarn snobs. Anyway, you can imagine my dismay when, upon returning home after a couple of years away, I found that not one, not two, but ALL THREE of my local yarn shops had closed. After a brief period of mourning I came to conclusion that perhaps the yarn gods had spoken, and that my current stash, swelled by the multi-skein purchases made at one of the shop’s closing down sales, was really enough to sustain me for a few months at least. Fast forward a couple of weeks, I was listening to one of my favourite podcasts; Knit British. Hosted by the well-informed and humorous Louise Scollay, the podcast champions British wool and the people behind the yarn, and often includes interviews with incredibly talented fibre folks, whilst also promoting up and coming yarny events. Anyway, my ears pricked up when I heard that a new yarn shop was opening up in Lancaster the following weekend. With all thoughts of my yarn diet forgotten, I hopped on a train to check out what Northern Yarn had to offer. When I arrived I was mildly taken aback by how busy it was. There was a film crew, a ginormous and incredibly elaborate cake in the shape of a knitting sheep, and a fair sized crowd of people spilling out of the yarn shop onto the street. Now the introvert inside of me squeaked RUN! but the promise of wooly skeins to squish and the possibility of the chance to speak to the owner just about prevented me from scuttling away. After a while the film crew left and the cake was moved outside so I was able to sneak a look in. What I found did not disappoint! The small shop was full to bursting with quality, British, breed-specific yarns in a huge array of colours and weights. As someone who has recently fallen in love with West Yorkshire Spinners yarns in a big way, it was a dangerous place to find oneself! Aside from their classic Signature 4ply, there was also the full colour palette of the brand spanking new Shetland Tweed Aran which I had succumbed to buying a sweater quantity of the previous weekend. As well brands I was familiar with, Northern Yarn also has it’s on yarn line, spun from fleece taken from local flocks. After a lot of dithering and a drawn out battle between the stern voice reminding me of the yarn diet, and the seductive whisper suggesting I buy a second sweater quantity of Shetland Tweed Aran, I came away with a skein of undyed Northern Yarn DK, made up of 75% Poll Dorset, and 25% Bluefaced Leicester. My justification being that the weeks spent collecting onion skins and avocado pits would be for nothing if I didn’t have any yarn to dye it with. Before I left I was lucky enough to speak to the owner of Northern Yarn, Kate Makin. Despite being incredibly busy, Kate was kind enough to spend a few minutes chatting to me about her shop and online business, asking what my plans were for my newly purchased skein, and even inviting me to the knitting group which she runs. It was so lovely to meet Kate and the other friendly women in the shop that day, and it reminded me of something that is sometimes quite hard to explain to people who aren’t part of the crafty community. Visiting a yarn shop isn’t always about the purchases you make, more often than not it’s about the people you meet. It’s about striking up conversations with complete strangers and sharing something meaningful. It’s about someone like me who sometimes gets a bit anxious in social situations feeling completely relaxed and welcome. Needless to say, yarny folks are quite often the best folks, and my trip to Northern Yarn will no doubt be the first of many!